1982. Isawa Nishikigoi Center – Yamanashi prefecture. I was first taken to the Isawa area by Mr. Kawabata who was employed at the Chiba offices of Kamihata. Isawa is some 200km south of Nagaoka and is a modern, bustling city with all amenities. The land is flat and the temperature is much warmer than the north. The ground water supplies are excellent yet there are few areas where mud ponds can be excavated as the ground will not retain the water. After an afternoon visiting Sakuma Koi farm; Yoshida Koi farm; Gamo Koi farm and Haibara Koi farm we found a nearby hotel, took a shower and a meal and then slept for the night. The next morning we entered the Isawa Nishikigoi Center where I first was introduced to the owner – his name was given as ‘Sakai San’. The facility was enormous but had the outward appearance of a scrapyard! Pond after pond after pond – all large and all outdoors, he also had several large indoor ponds which appeared to be for his more expensive stocks. I was asked to look around his farm freely whilst Kawabata San and Sakai San took tea and made conversation. If you need ‘the reddest reds’ – which I did; if you need ‘the blackest blacks’ – which I did and if you need ‘the whitest whites’ – which I did, then look no further than this outlet because every Koi in the ponds screamed of this incredible depth of pigmentation. I also knew that every Koi enthusiast back in the UK would actually fight to own just one of these specimens. After impatiently waiting for a further 30 minutes or so, Sakai San finally came out of his office and ambled over towards me with a deadpan face. I pointed to a pond and asked – ‘Ikura Desca’? – how much please? He looked at the Koi in the pond and simply replied – ‘Takai’ – expensive. Thus followed more ponds where the same answer followed. I immediately re-named him in my mind as ‘Takai San’ (Takai translates as ‘expensive’) as opposed to ‘Sakai San’ and started to become very inwardly agitated. Sakai San noticed my agitation immediately and began to smile, he already knew I needed to buy his Koi and I also knew that he knew! After a further three hours of selection and serious negotiation I purchased many Koi that day. As we drove back to Tokyo that afternoon, I gazed at the Polaroid photos I had taken of my purchases and the very high prices I had paid to Takai San. I then tried to imagine these Koi on display back in my ponds at Infiltration and the gasps that would emanate from the Koi enthusiasts of the day knowing full-well of the prices I would have to charge. Guess what? I think I had sold every single one of these Koi after a mere two weeks of arrival in the UK! 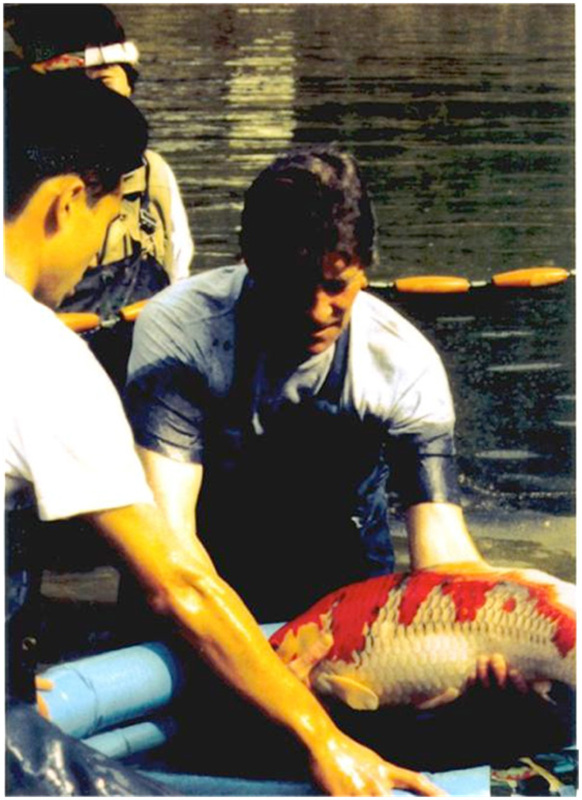 A few customers and dealers back then also wanted to know the breeder of these Koi and I chose to refer to them simply as ‘Sakai Sanke’ – the Koi world was not yet ready to be able to pronounce ‘Matsunosuke’. Alas, this resulted in confusion some years later when some UK dealers began to visit Japan to find ‘Sakai Sanke’. They did find them and bought them, only to discover later they had bought them from the wrong Sakai! I was then besieged with telephone calls asking when more of these Koi would be available. Although I returned again and again to ‘Takai San’ and purchased many more Koi from him, it was not to be until 1986 or so when he finally decided to take me under his wing and the relationship between us grew as the years passed. I owe more to this man in the subject of Nishikigoi than any other. My first impressions – ‘complete arrogance with total disconcern’. 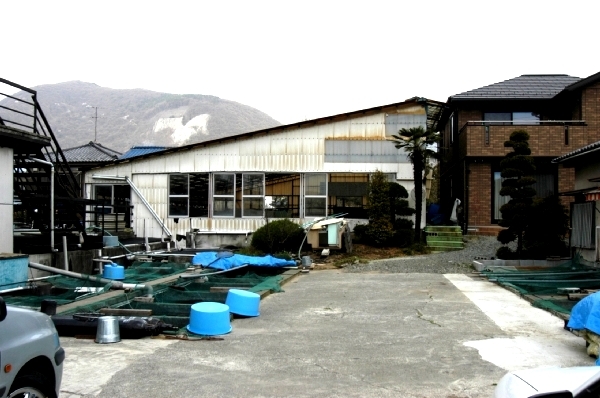 ‘Mystique of Matsunosuke’ – in 1996, I was the very first foreigner to be allowed to take part in the harvesting of ‘Takai’ San’s very best mud pond near Tashiro village – but only after Toshio was completely satisfied that my finger nails were short enough!